Before you put away all those Christmas decorations (I always dread that task, don’t you? 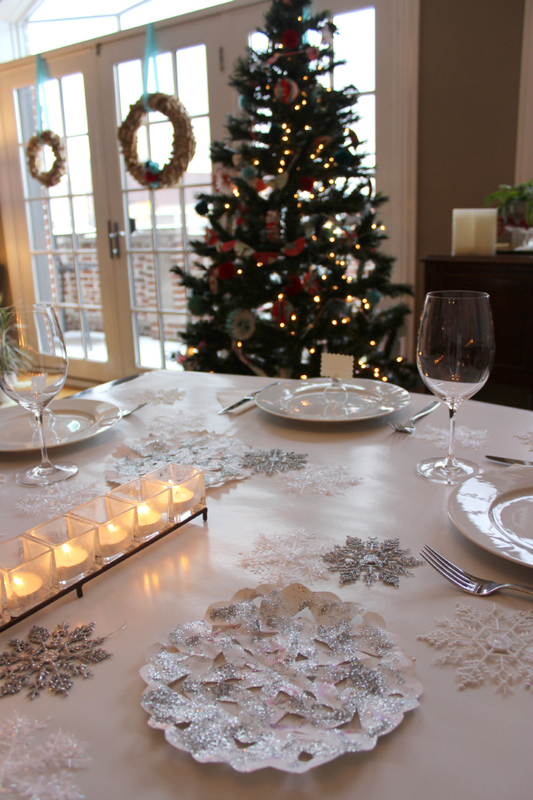 ), save any snowflake ornaments you have for this easy winter tablescape! For the snowflakes I used a mix of white and silver glittery snowflake ornaments you can find at Target or the dollar store in packs of 10 for a couple bucks. They typically come in a variety of colors so you can get creative with your color palette. 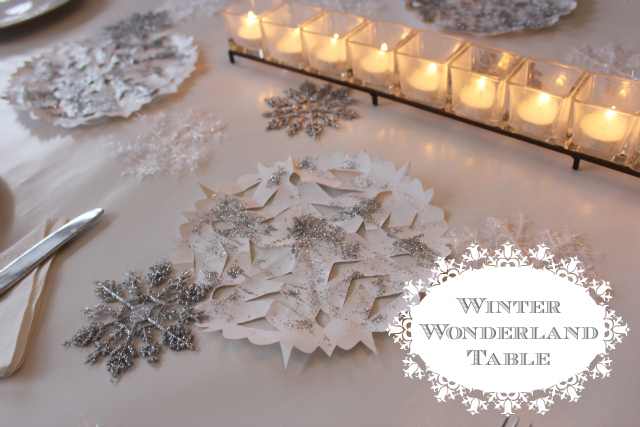 I also incorporated some big paper snowflakes that my 3 year old and I had made. Lately rather than using a tablecloth, I have been rolling out a piece of sturdy wrapping paper or kraft paper down the middle of the table, like this glossy white wrapping paper I got at the dollar store. It is a great alternative to fabric tablecloths, which I don’t like to use because mine are always wrinkled. Plus, once you are done with the meal you can just roll up the paper and throw it away! Now is the perfect time to take advantage of deep discounts on holiday decor and stock up for next year. 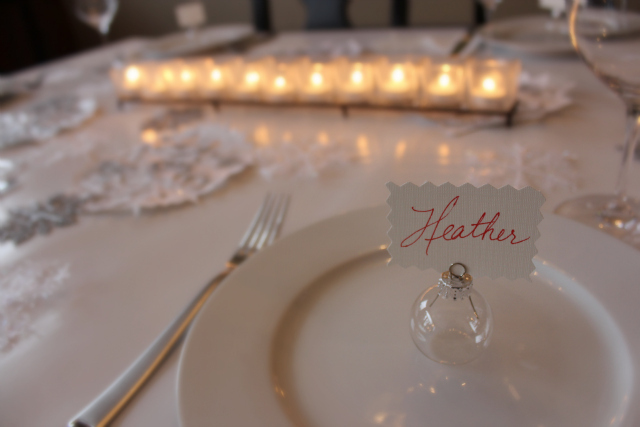 I found a pack of these clear bulb place card holders on clearance at Joann for next to nothing – I love them! 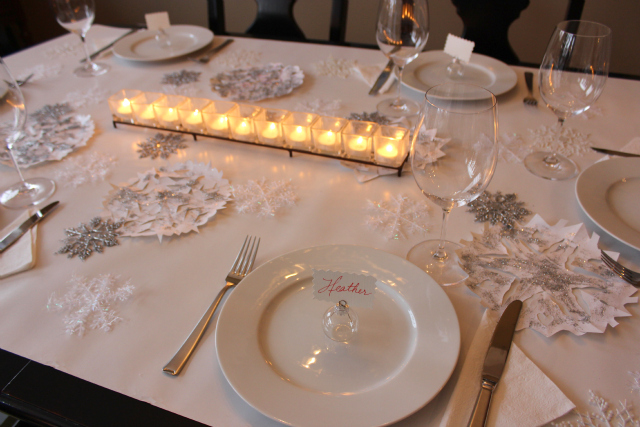 Just because the holidays are over doesn’t mean you can’t still dress up your table for a special meal – so stock up on snowflakes at 75% off and pick a snowy night this month to make this super easy tablescape!